Work injuries can be exacerbated by medical mistakes. 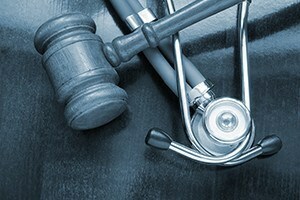 The insurer remains responsible for the costs associated with a medical error, but an injured individual may also have a viable medical malpractice claim against a negligent healthcare provider. At Pulgini & Norton, our workers’ compensation attorneys have over 40 years of combined experience assisting employees hurt on the job. A Boston medical malpractice lawyer can help you pursue the benefits and damages you need after suffering a work-related accident or illness. Employers in Massachusetts are required by law to provide workers’ compensation coverage to their employees. This is a form of no-fault insurance. If you were hurt at work, you can receive benefits regardless of whether you, your employer, or a co-worker was responsible for the injury. In exchange for these benefits, an employee forfeits the right to sue the employer for negligence. Workers’ compensation coverage provides injured employees with certain benefits if a job-related accident or illness results in a disabling condition that leaves the employee unable to work for at least five calendar days. Specifically, the insurance covers reasonable medical costs associated with a worker’s disabling condition, and it provides weekly wage benefits based on the extent of the disability. Other benefits may include vocational rehabilitation services to get the worker back on the job, a one-time payment for a disfiguring injury, and survivor benefits if a worker died as a result of an accident. An injured employee will receive medical care to treat the disabling condition for as long as it lasts. Sometimes, a physician, nurse, therapist, or other healthcare provider may make a mistake in the course of treating the worker. For instance, a healthcare provider may botch a surgery, provide inadequate rehabilitative care, or misdiagnose a condition. It may be possible to separate the costs associated with the initial injury from those caused by medical neglect, but since the initial condition was the result of a work-related incident, the insurer remains responsible for the costs of treating a residual disability. The injured worker can continue to receive benefits and may be able to receive additional benefits based on the change in his or her condition, such as if it turns from a temporary into a permanent condition. The injured person may also consider filing a medical malpractice lawsuit against the healthcare provider. While a worker cannot sue an employer for negligence based on a job-related injury, he or she retains the right to file a claim against a negligent third party, including healthcare providers. When a healthcare provider is negligent, the victim has the right to file a medical malpractice claim. He or she would have to show that the healthcare provider failed to meet the standard of care that is expected of other professionals in the same field, and that the failure caused the victim to suffer harm and damages. If successful, the victim may receive damages that include pain and suffering. The statute of limitations for medical malpractice claims in Massachusetts is three years. Like any third-party suit, a medical malpractice claim can affect your workers’ compensation benefits. For example, it may delay a settlement with the insurer. We can advise you on the risks and benefits of filing a medical malpractice lawsuit and how it can affect your workers’ compensation claim. Pulgini & Norton provides dedicated representation to Boston employees who need a medical malpractice attorney. Our work accident lawyers can assist you in seeking the benefits you need. We understand the intricacies of the Massachusetts Workers’ Compensation Law, and we can answer your questions about your right to benefits, help you file your claim, or advocate for you before the Department of Industrial Accidents. If a health care provider aggravated your injury, we can discuss whether you have a viable third-party claim against the provider and how it could influence your workers’ compensation benefits. We counsel and represent injured workers in communities throughout Massachusetts, such as Newton, New Bedford, and Weymouth. For a consultation with one of our attorneys, call our office today at 781-843-2200, or contact us online.